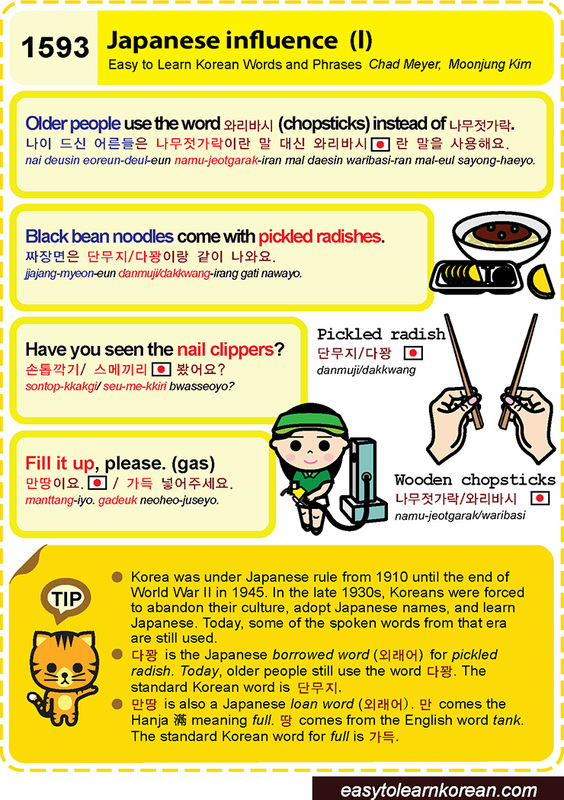 This entry was posted in Series and tagged Black bean noodles comes with pickled radishes., borrowed word, fill it up, full, Have you seen the nail clippers?, Japan influence, Japanese loan word, Japanese rule, Older people use the word 와리바시 (chopsticks) instead of 나무젓가락., pickled radish, please. (gas), tank, Wooden chopsticks, World War II, 滿, 가득, 나무젓가락/와리바시, 나이 드신 어른들은 나무젓가락이란 말 대신 와리바시 란 말을 사용해요., 다꽝, 단무지, 만, 만땅이요. 가득 넣어주세요., 손톱깍기/ 스메끼리 봤어요?, 외래어, 짜장면은 단무지/다꽝이랑 같이 나와요. by easykorean. Bookmark the permalink.